중국에서 출생한 탈북 학생들이 한국에 온 이후 적응하는 것을 돕는다. △ 두리하나교회 및 두리하나국제학교의 설립자가 중국에서 출생한 탈북 청소년들이 한국사회에서 소외당하고 외면당하고 있다고 NK News와의 인터뷰에서 밝혔다. 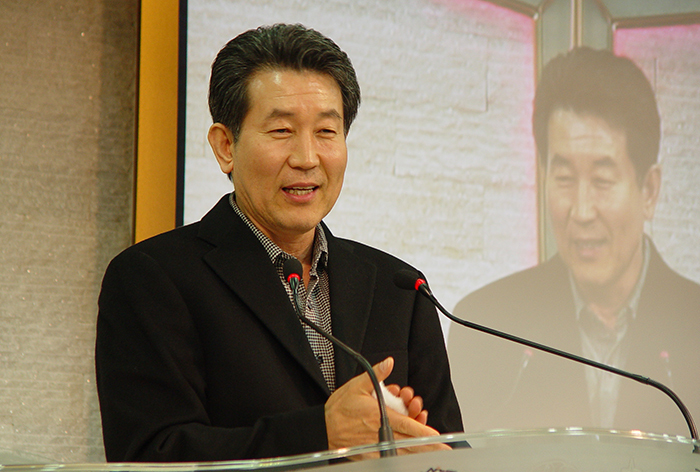 Half-Chinese youth defectors (children with North Korean defector mothers and Chinese fathers, who were born in China) have undergone isolation and exclusion in South Korean society, the founder of Durihana church and school told NK News. 천기원 목사는 1990년대부터 탈북자들을 중국에서 한국으로 오는 길을 만들며 탈북자들을 돕고 있다. 이제는 출신을 이유로 배척당하는 어린 탈북자들을 돌보고 있다. Chun Ki-won has been working at saving defectors since the 1990s creating routes from China to South Korea. Now, he is taking care of young defectors, especially those ostracized for reasons of ethnicity. 중국에서 일할 때 천목사는 중국 남편들이랑 사는 많은 탈북여성들을 만났다고 했다. 이 탈북여성들은 결국 한국에 아이들과 함께 오게 되었고 이런 아이들은 한국 엄마들의 아이들과 같은 혜택을 누리지 못했다. 이것은 이 아이들이 사회와 가족에게 분노를 자주 표출하는 이유이기도 하다. While working in China, Chun said he met many female defectors living with a Chinese husband, who eventually make the journey to South Korea with their children. Such children are not entitled to the same benefits their pure Korean mothers are, and this is one reason why such children frequently express anger toward society and toward their own families. 무엇보다 천목사는 그들을 받아들이지 않는 사회에 대한 분노와 그들을 계속 실망시키는 가족들에 대한 거부감을 인정해준다. 그리고 그들의 어머니들이 한국에 오기 위해 겪은 끔찍한 일들에 대해 아이들이 알 수 있도록 한다. To deal with their hostility toward a society that does not accept them and a family they feel has let them down, Chun first tries to make these youths aware of the ordeals their mothers have survived in reaching South Korea. 이 과정이 성공적으로 끝나면 그들의 태도가 극적으로 변한다고 한다. 그러면 ‘두리하나’가 그들이 사회에 기여할 수 있도록 가르칠 수 있다. Once this is achieved, Chun said their attitudes change dramatically, and Durihana can begin teaching them what they have to offer society at large. NK News: 언제 처음 탈북자들과 일하기 시작하셨나요? 동기가 무엇이었나요? NK News: When did you first start working for North Korean defectors? What is your motivation? 천목사: 저는 평범한 사업가였습니다. 1995년 12월에 훈춘(중국 북동부)에 새로운 호텔 사업을 시작하고자 갔습니다. 가는 길에 차 안에서 북한 국경을 볼 수 있었습니다. 주체탑이 보여서 사진을 찍으러 언덕을 내려갔습니다. 그곳에서 신발을 보게 되었는데 자세히 보니 한 여성의 시체였습니다. 몸이 얼어있었고 아무도 신경 쓰지 않았습니다. 운전자 말로는 그 여자는 북한에서 왔고 죽었다고 했습니다. 그곳에서는 이런 일이 자주 일어난다고 합니다. Chun: I was an ordinary businessman. I went to Hunchun (in northeast China) in December 1995 in order to start a new hotel business. On the way to there, I could see the North Korean border and, from the car I took, I found Juche tower and went down the hill to take a picture of it. Then I found shoes, and looking closely, it was a body of a woman. Her body was frozen, and nobody took a look it. The driver told me that she was from North Korea and had died, which is very common (there). 며칠 뒤 기차역에서 아이들을 몇 명 만났습니다. 처음에는 중국에 있는 조선족 아이들이라고 생각했으나 그들도 북한에서 온 아이들이었어요. 그 아이들에게 동전을 몇 개 주었는데 갑자기 중국 공안이 와서 그들을 곤봉으로 때렸습니다. 여자아이 하나는 귀가 찢어져서 피가 나고 있었습니다. 작은 여자아이를 그렇게 심하게 때려서 너무 놀랐습니다. 그 시점에 꽃제비(집 없는 북한 아이들)에 대해 알게 되었습니다. 시장에서 한 여자가 절망적으로 납치되지 않으려고 소리를 지르고 있었습니다. 운전자에게 물어보니 중국에서 북한 여자들을 납치하는 것이 불법이 아니라고 합니다. 그들은 신분증이 없는 불법체류자이기 때문이지요. A few days later, I ran into few children at the station. At first I thought they were ethnic Koreans in China, but they were also from North Korea. I gave some coins and suddenly, Chinese police officers came out and hit them with cudgel. One girl’s ear was torn and bleeding. I was so shocked that they were hitting a little young girl so harshly. That’s the moment that I got to know about kotjebi (homeless North Korean children). At the market, a woman was screaming forlornly not to be kidnapped by some guys. I asked my driver, and he said it is not illegal to kidnap North Korean women in China, as they are all illegal residents without identification. 그때는 이 기억들을 잊게 해 달라고 하나님께 기도를 했습니다. 한국에 돌아온 이후 저는 다른 개인적인 이유로 목회자가되었습니다. 중국을 다시 방문했습니다. 이번에는 선교를 위해 갔는데 또 탈북자들을 만났습니다. 두만강을 건너는 다리에서 또 두 구의 시체들을 발견했습니다. 그리고 두만 기차역에서 구걸하고 있는 북한 아이들을 만났고 시장에서 울부짖는 여자를 봤습니다. 저희는 그녀를 구하려고 $300 정도를 몸값으로 지불했습니다만 우리가 얘기하고 있는 동안 그녀는 사라졌습니다. 모든 것이 영화의 한 장면 같았습니다. I prayed a lot to God to help me forget these memories. After I came back to South Korea I turned to Christianity, due to another personal motivation. I visited China again, for the purpose of preaching, and met a few defectors again. On the Tumen Bridge, I found another two bodies of North Koreans in the river, met North Korean children begging at the Tumen rail station, and a women was crying at the market. Our team tried to save her, by paying a ransom, about $300, but while we were talking she just disappeared. Everything seemed like a movie scenario. NK News: 언제 이 선교회를 시작하셨나요? 저희랑 같이 공유할 기억이 있으신가요? NK News: When did you start this mission? Do you have some memorable experiences to share? 천목사: 제가 중국에 있는 북한 사람들을 위해 무엇을 할 수 있을까 고민을 하다가 이 사안을 대중에게 알리기로 했습니다. 웹사이트를 만들어서 제가 본 것과 그들의 이야기를 올렸습니다. 이 일은 1999년 10월에 있었던 일이고 그 이후로 탈북자들로부터 전화와 메일을 받기 시작했습니다. 제가 처음으로 구출작업을 한 것은 2000년이었습니다. 한국에 있는 탈북자를 만났고 그의 어머니가 여전히 중국에 계셨습니다. 그는 그의 어머니와 다시 만나는 것을 도와 달라고 했고 저는 별 생각 없이 그러겠다고 했습니다. Chun: I thought what I can do for North Koreans in China, and decided to popularize this issue. I made a website and uploaded what I saw, and their tragic stories. It was October 1999. Then I started receiving calls and emails from defectors. My first rescue operation was in 2000. I met one of the defectors who settled in South Korea, whose mother was still in China. He hoped to reunite with her mom, and I thoughtlessly said yes. 저는 제가 그에게 뭐라고 했는지 기억이 안 나지만 그는 제 말을 진지하게 받아들였고 우리의 구출 작업에 대해 이야기를 나누기 위해 찾아왔습니다. 후원자의 도움으로 경비와 교통비를 마련할 수 있었습니다. 그리고는 중국에서 수영으로 홍콩으로 건너온 탈북자가 중국에 있는 자기 딸을 구해 달라고 부탁했습니다. 그래서 아무런 사전 지식이나 준비 없이 두 명의 탈북자를 구하게 되었습니다. I even forgot what I told him, but he took my words as quite serious, and came to me to discuss our rescue operation. Thanks to a donor, we could prepare a transportation fee, and expenses for a broker. Then another defector from Hong Kong asked me to save her daughter still in China. So I had to save two defectors without any knowledge or preparation. 일단 북경으로 갔습니다. 그리고 지도를 구해서 베트남과 캄보디아로 가는 길을 찾았습니다. 우리의 여정이 끝나고 나니 한국 공무원은 제 이야기를 믿어주지 않았습니다. 제가 거짓말을 한다고 했습니다. 우리는 말도 안 되는 길로 왔다고 했습니다. 중국과 베트남 사이의 국경은 경찰과 코브라로 가득하고 베트남과 캄보디아 사이는 지뢰밭이라고 했습니다. 대부분의 사람들은 운이 좋았다고 하겠지만 저는 하나님의 은혜라고 생각했습니다. 그 이후에 몽고 사막 길로 20명을 구했습니다. 여전히 구출작업이 저희의 가장 중요한 사역입니다. I just headed for Beijing, and bought a map, to find a route to Vietnam and Cambodia. After we finished our journey, a South Korean government official didn’t believe my story. He thought that I was lying, as we had just come through an impossible route. The border district between China and Vietnam was full of police officers and cobras. The route between Vietnam and Cambodia was a minefield. For common people it is luck, but for me, it was the grace of God. Later I saved 20 North Koreans via the Mongolia desert route. Still, rescue is our No. 1 priority. NK News: 북한에서 직접 선교하시나요? 가능한가요? NK News: Do you do missionary work in North Korea? Is that possible? 천목사: 저는 갈 수 없습니다. 가끔 미국 시민권자인 기독교인들이 선교를 가지만 결코 쉬운 일이 아닙니다. 주로 치약과 같은 생필품을 전달하는 사역이었습니다. 저희의 가장 중요한 사역은 구출이라고 생각합니다. 사람의 목숨을 살리는 일이지요. 하지만 선교를 하는 것이 전혀 불가능한 일은 아니지요. 다만 조금씩만 가능하겠지요. Chun: I am not able to go to North Korea. Christians with American citizenship occasionally visit North Korea with intention of spreading the gospel, but it is not an easy task to accomplish. They usually were only able to provide commodities like toothpaste. I consider rescue missions as our top priority as it is about saving lives. Of course, it is not completely impossible to do missionary work in North Korea. However, it is very limited. NK News: 여전히 해외에 셸터들을 운영하고 계신가요? 만일 그렇다면 어디에 있나요? NK News: Are you still operating shelters overseas? If so, where do you work? 천목사: 네, 태국, 라오스, 중국에 셸터들이 있습니다. 태국은 미국으로 가고 싶어 하는 탈북자들을 위한 곳이었습니다. 감사하게도 미국 정부가 이번 3월부터 라오스에 직접 셸터를 운영하기 시작했습니다. 저희의 일을 많이 줄여주었습니다. 근래에는 중국에서만 셸터를 운영하고 있습니다. Chun: Yes. We used to manage shelters in Thailand, Laos and China. The Thailand shelter was dedicated to help defectors who want to go to the U.S. directly. The U.S. government started managing shelters in Laos since this March. It is very thankful for us, which took a lot of effort from us. Recently we are operating shelters only in China. Chun poses with some of the beneficiaries of Durihana’s work. 중국 아버지와 북한 어머니 사이에서 태어난 아이들을 위한 고아원을 운영하기도 했습니다. 북한 여자들이 중국 남자들에게 팔리면 그들은 결혼을 하고 아이를 갖게 됩니다. 엄마가 한국으로 가게 되면 이 아이들은 고아가 되지요. 이 중국 아버지들은 주로 40-50대이고 알코올중독자들이고 폭력적입니다. 남겨진 아이들은 교육을 받지 못합니다. 이 고아원도 문을 닫았습니다. 중국 공안이 계속해서 단속을 하고 2009년에 Laura Ling 사건이 발생했습니다. Also, we used to manage orphanages for children who were born between Chinese father and North Korean mother. When North Korean women are sold to Chinese men, they are married and have a baby. When the mother heads for South Korea, the children become orphans. Chinese fathers, they are married with North Korean women when they are in their 40s or 50s and are usually alcoholic and abusive. The children left behind cannot be educated. The orphanage, however, is not operating now. There have been crackdowns from Chinese police a few times, and the Laura Ling incident happened in 2009. ‘For the people from North Korea, they are given a house, a special opportunity to enter universities with their tuitions fees waived, and they are often given scholarships too. However for the half-Chinese youth, there are no such benefits available. NK News: 요즘은 어떤 일에 매진하시나요? NK News: What project are you concentrating on these days? 천목사: 중국 아버지와 북한 어머니에게 태어난 탈북청년은(한국에서) 정부 지원을 받지 못합니다. 북한에서 온 사람들은 집을 얻고 등록금 장학금을 받고 대학 특별 입학의 기회가 주어집니다. 하지만 반 중국인인 이 아이들에게는 아무것도 없습니다. 더 심각한 것은 그들이 부모로부터 버림을 받았다고 생각합니다. 그들의 엄마들은 대부분 새 남편을 얻었습니다. 이 아이들을 처음 만났을 때 그들의 대화는 거의 전부 욕이었고 칼로 서로 싸웠습니다. 그들은 신체보다는 마음에 심각한 상처를 입은 상태였습니다. 북한에서 온 탈북 청소년의 대부분은 그들의 작은 키 때문에 낮은 자존감이 있지만 중국에서 태어난 탈북 청소년은 키는 크지만 가족과 사회에 대한 증오심을 갖고 있습니다. Chun: For the defector youth born to a Chinese father and a North Korean defector mother, there is no governmental support (in South Korea). For the people from North Korea, they are given a house, and a special opportunity to enter universities. But for the half-Chinese youth, there’s nothing. Even more serious, they feel they were abandoned by their parents. Most of their mothers have new husbands. When I first met them, almost all of their words were curses, and they fought each other with knives. They have serious wounds in their minds, rather than physical wounds. Usually youth from North Korea have a lack of self-esteem due to their short height, but half-Chinese youth have a hatred against their family and society. 이 아이들을 위해 학교를 운영하고 있습니다. 제가 특별히 강조하는 교육은 사랑과 배려입니다. 이 아이들에게 북한에서 엄마들의 삶에 대해 설명해주고 그들이 한국에 오게 된 여정을 알려줍니다. 학생들은 그 이야기를 듣고 충격을 받습니다. 엄마들이 아이들에게 그들의 그런 과거에 대해 알려주지 않으니까요. 많이 울고 엄마에게 고맙다고 전화를 합니다. 그들은 아이들을 버릴 수 있었지만 버리지 않았다는 그들의 엄마들을 이제 이해합니다. 대부분의 아이들은 삶이 힘들었기에 아주 똑똑하고 강합니다. 종교적인 사랑과 배려를 가르치려고 노력중입니다. 그들의 좋은 머리를 이웃들을 위해 사용할 수 있도록 하기 위해서 입니다. I am managing a school for these students. What I particularly highlight for education is love and consideration. I explained the lives of their mothers from North Korea, and their journey to South Korea. Students were really shocked to hear that, as their mothers usually didn’t talk about their pasts with their children. They cried a lot, and called to their mothers to say thanks. Finally they understand their mothers, who didn’t abandon their children even though they could have. Most of the youth are really shrewd and strong due to their harsh lives. I am trying to teach religious love and consideration, as they can use their smart brains for their own interest. 어제는 한 아이가 메르스를 예방하자며 반 친구들과 선생님들과 목사님들 전부를 위해 마스크 한 박스를 샀습니다. 제가 그 아이라면 제 것만 샀을 것 같은데 그 아이의 태도에 정말 감동을 받았습니다. 얼마나 아름다운지요! 저는 늘 일등을 하는 사람보다는 다른 사람들에게 감동을 줄 수 있는 사람이 되라고 부탁을 합니다. 그들의 눈이 반짝이는 것을 보는 것이 정말 행복합니다. Yesterday, a boy bought a box of masks for his all classmates, pastors and teachers, saying that we all should prevent MERS. If I were him, I would have bought only mine. I was really impressed by his behavior. How lovely he is! I always say that you guys should become the people who can move others, rather than who can defeat others. I am really happy to see their eyes shining. 두리하나 건물들은 교실, 기숙사, 식당 그리고 기도실로 구성이 되어있다. 천목사는 나를 지하 식당으로 인도해주었다. 그곳에서 아이들은 같이 점심식사를 하고 있었다. 한 여자아이가 한국 말을 전혀 못했다. 20일 전에 도착했다고 한다. 아이들은 전부 밝은 얼굴로 웃고 있었다. Durihana buildings were composed of a classroom, restaurant, dormitory, and rooms for prayer. He led me to the restaurant underground. Children were having lunch together, and a girl couldn’t speak Korean at all. He said she arrived here only 20 days ago. The children were all laughing with bright faces.